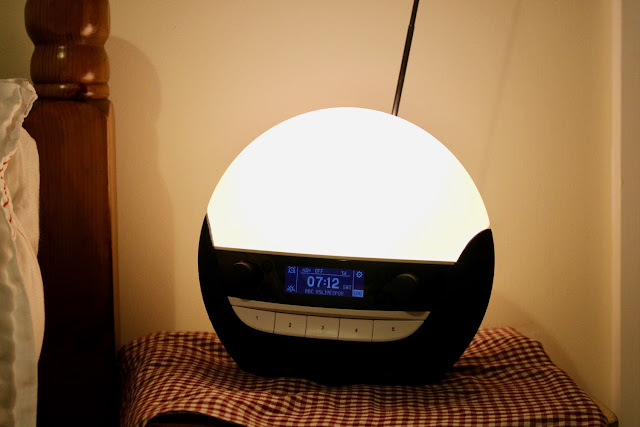 The light emitted from the Lumie clock progressively dims in 'sunset' phase, and brightens for the 'sunrise' alarm. The gentle wake up call is designed to mimic a natural waking pattern, which is far less unsettling to the body's natural rhythm than the sudden jerk out of sleep that is given by your standard alarm call. The light output itself is also special. It is a natural warm UV light, rather than the hard blue light emitted by many LEDs and screens. The natural light is recognised to be kinder on the eyes and mind, and allows your body to feel more relaxed. In the evenings, I have the unit set up to give me a 20 minute 'sunset'. This means the light starts at a level that you can happily read with, before beginning to progressively dim over the course of the period. After ten minutes, you know it is time to put the book down; and then after another five you feel your eyes beginning to naturally close as you are soothed into sleep. In the mornings, I have a 15 minute wake-up. This means the light progressively brightens over the period, before ending the sequence with an alarm of your choice: beeps, natural noises, or the integrated DAB radio. To date, the progressive light has effectively woken me; then a friendly blackbird call lets me know it is time to rise. Both the sleeping and waking patterns do feel a lot more natural. The progressive bedtime is better than me laying and reading for an undefined amount of time (often too long). The progressive sunrise is far less unsettling than the siren alarm that I used to get from my iPhone. 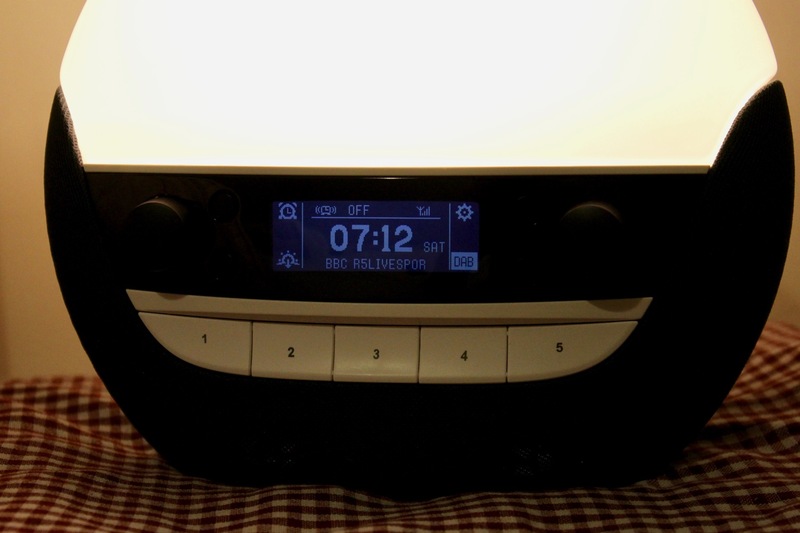 The integrated DAB radio has also proven to be a nice feature. With pre-set stations, you can quickly flick between soothing music; ideal for bedtime stretching routines. There is also the option to listen to tracks on a USB stick, via Bluetooth, or through an AUX cable. You can tailor the Lumie set-up to give you different length sequences at either end of the day. There are also a whole host of different ambient sounds to choose from: such as coffee shop noise or waterfalls, with some finding this white noise comforting before the sleep cycle. 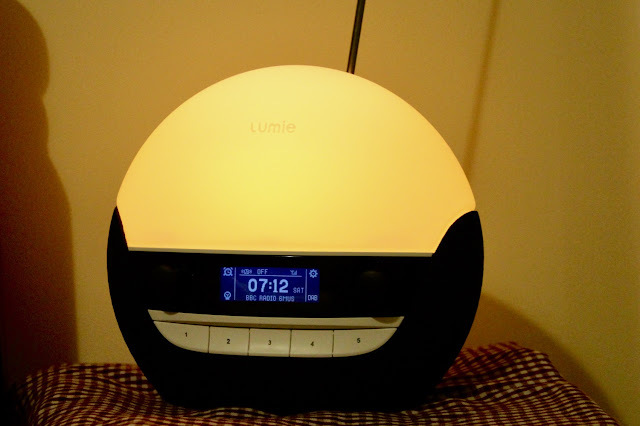 My experience of the Lumie Bodyclock is that it provides a beneficial regularity to your sleep cycle. The light is great to read by in the evenings, and the progressive dimming is soothing. The waking call is far more gentle than a traditional alarm, and leaves you feeling noticeably more positive after waking up. Starting and finishing the day right, through good sleep hygiene, could be a major advantage to performance. Team Sky were one of the first to recognise the importance of sleep quality; they take their own bedding and air conditioning units to hotels. It would not surprise me if Lumie alarm clocks are also soon on their kit lists; it seems like a marginal gain well worth investing in. Does the radio actually work on yours? On mine it is flakey, and the unit crashes if you try to use the radio manually.